Set yourself up for successful saving. With our Money Market Savings Account, you’ll have easy access to your money at all times, plus free checks (bank stock only) and limited check-writing capability. And with our highly competitive, tiered interest rates, you’ll earn more as your balance grows. And, our tiered interest rates will help you earn more as your balance grows. 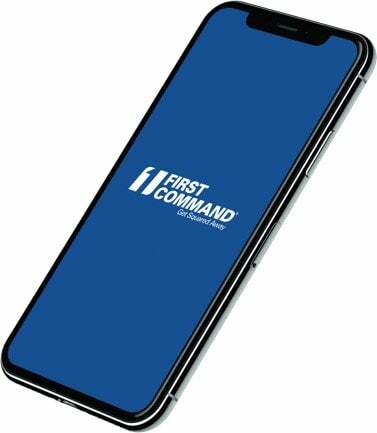 First Command’s Money Market Savings account has a $25 minimum opening deposit amount. You can manage the account as well as pay and receive bills with OnCommand online banking, and sign up for free digital eStatements to simplify your banking experience. You’ll also have access to unlimited telephone banking, at no charge. Bank from anywhere. At any time. Download the MobileCommand™ app for iPhone® or Android®, and discover the simplicity and convenience of doing your everyday banking right from your mobile device. 1. Federal regulations allow a maximum of six withdrawal/transfer transactions per statement cycle, including checks and excluding ATM transactions. Excess withdrawal fee is $10.00 for each withdrawal exceeding six. 2. Interest credited and compounded monthly. Increasing interest tiers with minimum balances of $1, $2,500, $10,000, $25,000, $50,000, $100,000. 3. Coverdraft available from another FCB deposit account or FCB line of credit. 4. First Command Bank does not charge a fee for the first six ATM withdrawals per statement cycle. Subsequent transactions will be charged $1.50 each. There is no surcharge to FCB Debit used at ATMs in the MoneyPass® network or NYCE networks. FCB will rebate other ATM surcharge fees, charged by ATM owners, up to $15 per statement cycle. 5. Federal regulations allow a maximum of six withdrawal/transfer transactions per statement cycle, including checks and excluding ATM transactions. Excess withdrawal fee is $10.00 for each withdrawal exceeding six. 6. Rates are subject to change without notice. 7. APY stands for Annual Percentage Yield.